Last Wednesday, the DC Environmental Network (DCEN), DC Fiscal Policy Institute (DCFPI), and District Department of Public Works (DPW), convened a budget briefing to go over the budget priorities of DC Mayor Muriel Bowser. This briefing focused on the proposed FY 2018 budget for DPW. We received some bad news about Mayor Bowser’s DPW budget priorities. Since Mayor Bowser appointed Chris Shorter to be Director of DPW in 2015, the District’s zero-waste community has been excited at the prospect of DPW implementing the programs and policy changes necessary to move the District closer to its stated goal of achieving a total waste diversion rate (recycling, composting, and conversion) of 80% by 2032. These improvements in DPW’s focus can to some degree be attributed to Council action, during former Mayor Gray’s administration, to create the DPW Office of Waste Diversion, an important infrastructure improvement to keeping some of the agency focus on improving recycling. Arguably we have a better run agency then we did in 2015 but we also have a lot of work to do to change a broken, damaged recycling system! 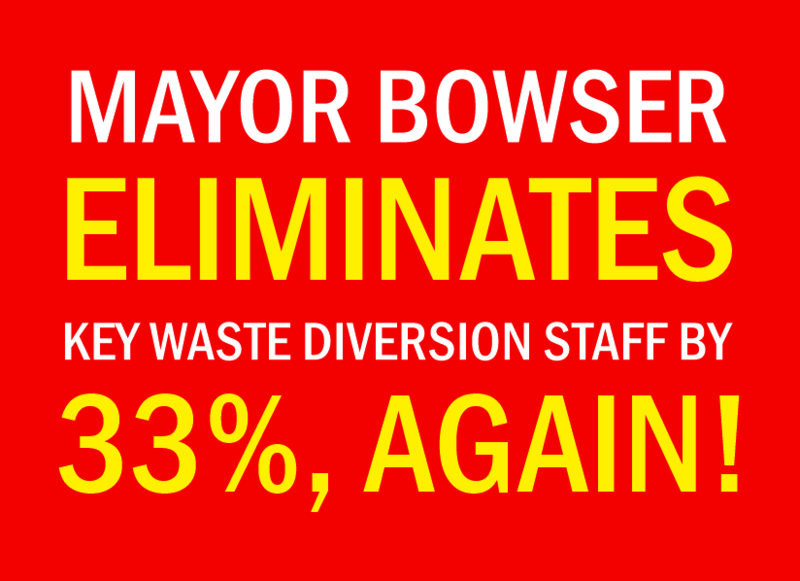 At last week’s budget briefing DCEN learned that Mayor Bowser’s budget eliminated, for the second time in two years, 2 (of 6) important staff positions from the Office of Waste Diversion, and reduced the Office’s budget by $447,000. We think these cuts are unacceptable, reflect a lack of vision, and don’t adequately support the goal of increased recycling. 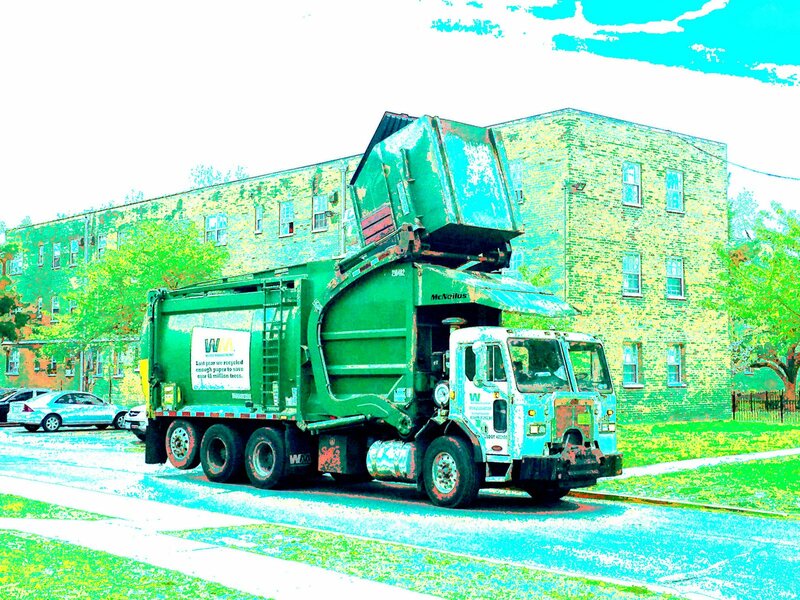 introducing a Pay-As-You-Throw pricing structure for waste collection services; and, by 2032, achieve a total waste diversion rate (recycling, composting, and conversion) of 80%. This DPW budget will create an office with inadequate staff and resources to do little more than comply with reporting requirements and other paperwork. 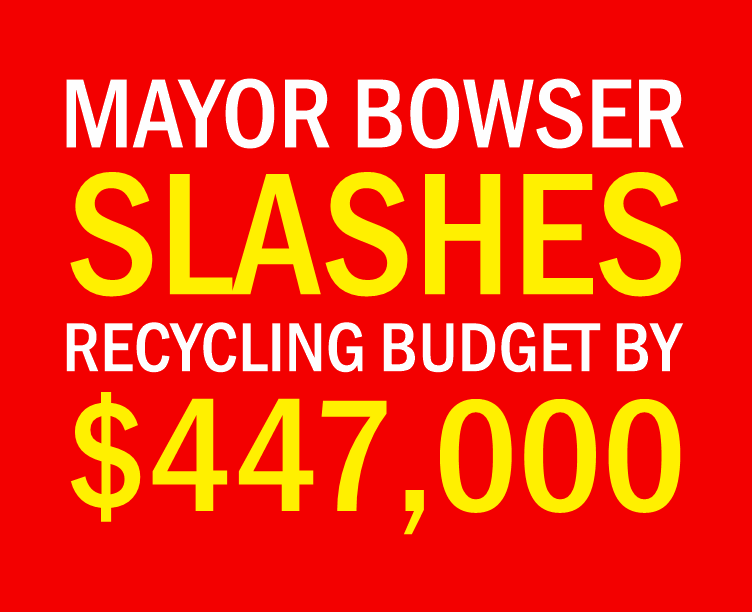 This DPW budget means that the District of Columbia, our nation’s capital city, will continue to have some of the worst recycling rates in the region and will try and squeeze more recycling from a system that has already failed us for over 2.5 decades. This DPW budget does nothing to move the District towards a new solid waste management system that could help District ratepayers save money, reduce green-house gas emissions, and increase DC per capita recycling rates. The DC Environmental Network is committed to advocating for, as we did successfully last year, restoration of both Office of Waste Diversion staff positions, and, restore at least some funding for the planning and program development necessary to help DC government make progress towards achieving its own Sustainable DC zero-waste goals. If we do this, and we can, we will continue the progress made the last two years. Let me know if you want to join our campaign to fix this. This is the second of two DCEN/DCFPI DC agency briefings! On April 21st at 12:00 PM, you are invited to join the DC Environmental Network (DCEN), DC Fiscal Policy Institute (DCFPI), and DC Department of Energy & Environment (DOEE), for a special briefing on Mayor Bowser’s proposed FY 2018 Budget. This event will be held at the offices of DOEE, 1200 Fist Street NE, 5th Floor. Click here if you want to attend the DOEE FY 2018 budget briefing! Mayor Bowser released her proposed Fiscal Year (FY) 2018 Budget on April 4th. At this April 21st briefing, DOEE Director Tommy Wells, and staff, will present the details of Mayor Bowser’s budget as it relates to the Department of Energy & Environment. Participants will be able to ask questions and share their thoughts about the Executive’s budget priorities for this agency. The next few years could be very challenging as the new President and Congress establish their own budget priorities. Federal cuts to important District programs could create budgetary pressures that hurt every District agency and threaten important programs and initiatives that fund human needs and are important to the sustainability community. It will be critical for all of us to understand our current budget and how it might change as we move forward. Hope to see you on the 21st. Click here if you want to be briefed on the Department of Energy & Environment FY 2018 budget! “DOEE’s mission is to improve the quality of life for the residents and natural inhabitants of the nation’s capital by protecting and restoring the environment, conserving our natural resources, mitigating pollution, increasing access to clean and renewable energy, and educating the public on ways to secure a sustainable future. The agency’s core responsibilities include, but are not limited to, enforcing environmental regulations; monitoring and assessing environmental risks; developing energy and environmental policies; issuing permits; and providing residents and local businesses with funding, technical assistance, and information on initiatives designed to ensure a more resilient and sustainable city.” – About DOEE. “DOEE envisions a nation’s capital that sets the standard for environmentally responsible and sustainable practices. We envision a city whose rivers and waters are fishable and swimmable; whose buildings and infrastructure help protect our health and environment; and whose residents, businesses, and visitors embrace and employ smart environmental practices in their daily lives and work together to deliver a clean, healthy, and vibrant city to future generations” – About DOEE. 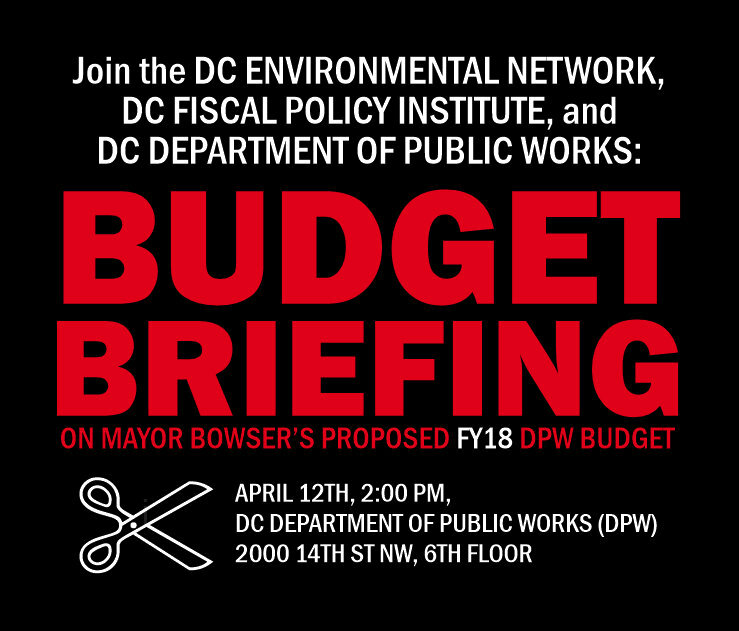 On April 12th at 2:00 PM, you are invited to join the DC Environmental Network (DCEN), DC Fiscal Policy Institute (DCFPI), and DC Department of Public Works (DPW), for a special briefing on Mayor Bowser’s proposed FY2018 Budget. This event will be held at the offices of DPW, 2000 14th Street NW, 6th Floor. Mayor Bowser is scheduled to release her “proposed” budget sometime around April 4th. At this April 12th briefing, DPW Director Chris Shorter and staff, will present the details of Mayor Bowser’s budget as it relates to the Department of Public Works. Participants will be able to ask questions and share their thoughts about the Executive’s budget priorities for this agency. Although we will hear about the full DPW budget, the DC Environmental Network is particularly interested in the DPW programs that focus on zero waste issues. The next few years could be very challenging as the new President and Congress establish their own budget priorities. Federal cuts to important District programs could create budgetary pressures that hurt every District agency and threaten important initiatives that fund basic human needs and are important to the sustainability community.It will be critical for all of us to understand our current budget and how it might change as we move forward. Hope to see you on the 12th. Click here if you want to be briefed on the Department of Public Works FY2018 budget!